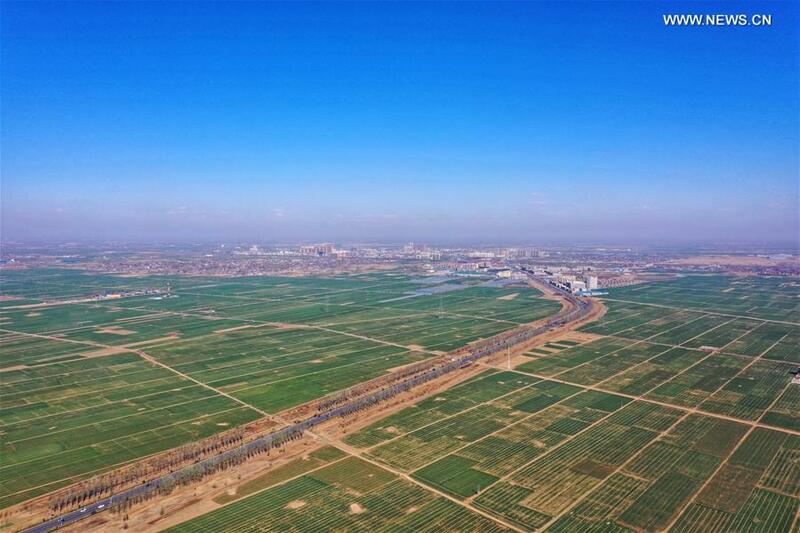 XIONGAN, Hebei Province, April 1 (Xinhua) -- China's Xiongan New Area, a millennium green city featuring innovative development in northern China, is to transform from being a just blueprint to a tangible reality starting this year. On April 1, 2017, China announced plans to establish Xiongan New Area, located about 100 kilometers southwest of Beijing, in what an official statement called "a strategy that will have lasting importance for the millennium to come and a significant national event." Chen Gang, vice governor of Hebei Province who also heads the management committee of Xiongan, said a large-scale building phase will start this year. In January, China's central authorities approved the 2018-2035 master plan for the area. More than 200 teams and 1,000 experts from China and abroad participated in the drafting of the plan, Chen said. "A carefully-drafted plan ensures the smooth and quick construction of the area in the future," he said. Xiongan spans three counties in Hebei-- Rongcheng, Anxin and Xiongxian. Now work is underway to lay the underground pipelines and water, power, gas infrastructure of the area, which is expected to grow to 1,770 square kilometers, roughly the size of Shenzhen. Construction is slated to begin soon in the Rongdong area, a 13-sq-km residential area that is expected to be home to 170,000 people to the east of Rongcheng County. The first batch of residents, both from resettled local residents and new citizens, will move into the compound by 2020, said Yu Zhenhai, director of the area's comprehensive law enforcement bureau. Authorities are making detailed plans to transform ordinary rural towns into 22 special townships, each featuring different characteristics such as intelligent technologies, elderly-friendly environment or creative industries, he said. A hive of construction activities is underway at Zangang Township, in the area's northeastern part, to build an intercity railway between Beijing and Xiongan. The express link, set to be operational by 2020, will cut the commuting time down to 30 minutes. Xiongan will become a modern city that is green and intelligent with "relatively strong competitiveness and human-environment harmony by 2035," according to the master plan that stresses high-quality development. Before building the new city, the first step is to add greenery and plant trees. Near the railway construction site is an extensive forest that has been newly grown in the last two years. The afforestation project, spanning over 7,000 hectares, started in November 2017, and it took more than 50,000 people to plant over 11 million pine, peach and locust trees. Gao Qiuliang is one of the tree planters. "Each tree has its own identity card because they are digitally managed so that we know when a certain section of trees needs weeding, watering or trimming," he said. This year, more than 13,000 hectares of trees will be planted across Xiongan. The forest coverage rate in Xiongan will increase from the current 11 percent to 40 percent in future. Intensive efforts are also underway to clean up and feed the vast Baiyangdian wetland. From February this year, a pump station started operation at Baiyangdian to draw water from the Yellow River, which is about 482 kilometers away. The pump station feeds water into the wetland during the winter season when the water level is low. Xiongan's polluting industries of shoe-making, dyeing and plastic manufacturing are being relocated or transformed with environment-friendly technologies. Only research and exhibition functions will be retained, said Liang Yuan, deputy director of the area management committee. "In the future, about 70 to 80 percent of the growth of Xiongan will come from high-end and hi-tech industries," said Wu Hequan, deputy director of the expert advisory committee of Beijing-Tianjin-Hebei coordinated development. Das Intellitech, a Shenzhen-based company specializing in intelligent solutions in medical, transportation and architecture, has set up its northern China headquarters at Xiongan. "Less than a week after our new office was set up in Xiongan, we were able to hire the staff and talent we need and want," said Lyu Feng, company board chairman. The company is among the first group of enterprises to establish operations in the Xiongan citizen service center. "Our experience in Pudong of Shanghai and Shenzhen has proven helpful in Xiongan, and in building Xiongan, our proficiency and technological level is further boosted," he said. "Many other cities including Shenzhen are asking our technical staff back to share the latest experience," he said. According to the plan, Xiongan will prioritize industries such as new generation information technology, modern life science and biotechnological industry, new material, modern services, and green agricultural sectors. The area will focus on attracting talent in these industries, as well as in finance, commerce, digital, education and medical fields, said Liang Yuan. "Educational and medical resources have to be put in place to keep the talent," said Liang. A group of kindergartens, elementary and secondary schools in Xiongan have been paired up with leading schools in Beijing to improve their levels of service, he said. According to the master plan, Xiongan will strive to build first-class technology and innovation platforms, with the best research universities to foster talent and innovative policies and mechanisms to serve growth tech firms. A university named after Xiongan is expected to be established, authorities said. Xiongan is aiming to become a significant part of the Beijing-Tianjin-Hebei cluster and plans to take over Beijing's non-capital functions and provide a Chinese solution to "big city malaise," including overcrowding, pollution and traffic congestion. It has attracted increasing attention from overseas companies, given its national significance and substantial development potential. Jerome Frost with Arup, a British design firm that participated in the area's design, said he proposed the use of recycled materials to help the city work in balance with itself and become a new benchmark for global cities. Many cities across the world are grappling with the balance of nature and buildings, and Xiongan gives an opportunity to readdress the balance and demonstrate how that is possible, he said. "The designers' teams for Xiongan come from different backgrounds and have different ways of thinking, concepts and presentation styles, which brings a truly global vision to how Xiongan is built," said Li Xiaojiang, who is also on the expert advisory committee of Beijing-Tianjin-Hebei coordinated development. Xiongan will actively serve Beijing's role as an international exchange center in its proactive expansion of opening-up, according to the master plan document. This year, Xiongan will pioneer policies on foreign capital and trade facilitation as part of the further opening-up drive, authorities said. "Xiongan is a place to realize dreams and self-value," said Luo Shuang, a young graduate of engineering from Tsinghua University, who came to Xiongan in July last year. "It is rather common for us to work overtime, and every day is a challenge, but it is a great honor to be part of the efforts of building a high-profile city from scratch," he said.